Red Lion’s Modular Controller series offers a cost effective solution to integrating multi-zone PID control, data acquisition and I/O into your PC, DCS or PLC control system. You can drag and drop controller data to PLC registers in seconds using point-and-click data mapping from an extensive menu of built-in serial and Ethernet drivers. No tedious PLC code to write. Instantly Ethernet-enable your PLC for free! Not only are programming costs slashed, you can eliminate costly add-on I/O and analog cards and solve applications simply using an inexpensive brick PLC. 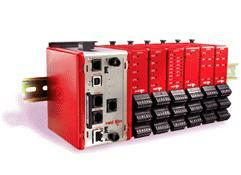 The high-density DIN rail design saves panel space and eliminates cutouts. All modules can be hot-swapped -- the master automatically programs a replaced module. The Modular Controller is configured using Red Lion's Crimson 3 software. Download your FREE full version here. The table below shows the functionality of the 4 different model levels.